I am unfamiliar with Scarlett’s work, and “Asphodel Meadows” seemed an apt introduction. 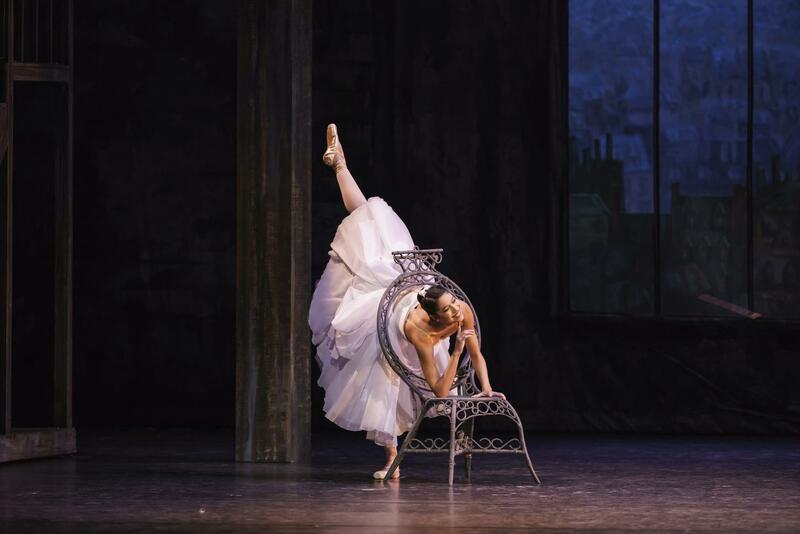 The piece was not only Scarlett’s debut choreography with the main company in 2010, but also his international breakthrough as a choreographer. The meadows named in the title are those of the ancient Greek underworld, covered in white asphodel (an herb). Ordinary souls dwell there in the afterlife – and although they’re not the luxurious Elysian Fields, they are described by the poets as a fertile and flowery paradise of sorts. Let’s assume that the twenty dancers Scarlett included represent such souls. How is their afterlife? Set designer John Macfarlane presented the dancers not with a sunlit playground, but rather with a clearly structured space featuring a background of movable black panels of different widths. Where does the sun-yellow light that shines through the narrow gaps between the panels come from? Is it late summer beyond the meadows? But no: when the panels glide sideways, they reveal a white backcloth with black, blurry vertical lines as if smeared by their painter. Do they resemble lifelines that only briefly touch before separating? Macfarlane’s costumes – strapless dresses for the women and simple pants and tops for the men – are in natural colors. Seen together at the curtain call, when Jennifer Tipton’s lighting was a shade warmer, they reminded me of a bunch of everlasting straw flowers. What is most heartening about this afterlife is the music that moves these souls: Francis Poulenc’s Double Piano Concerto, which the composer himself described as “blithely bravura”. Its three movements vary in tone. Brisk, sassy melodies roll into serious and longing ones. A few bars later, they mockingly relativize themselves. Moments of sudden silence cause the dancers to freeze, until the music bubbles jollily along. Each movement features a leading couple (Fumi Kaneko & Calvin Richardson, Mayara Magri & Tristan Dyer, Sea Maeda & Leo Dixon) and a group dance. Scarlett employs a diverse palette of movement textures; by describing its range one would get lost in detail. The choreography is united by its restraint (these souls dance for themselves, not for the audience) and by a strong sense of togetherness, care, and acceptance. Every soul gives the others room to breathe and to be. The dance is neither heavy nor light; weight simply doesn’t matter. The grips in the partnering are so accurate and assured that the ensuing lifts and poses, regardless of their intricacy, seem effortless and inevitable. We are brought back from the meadows into real life by a whiff of lunch wafting across the tier. It heralds the break. 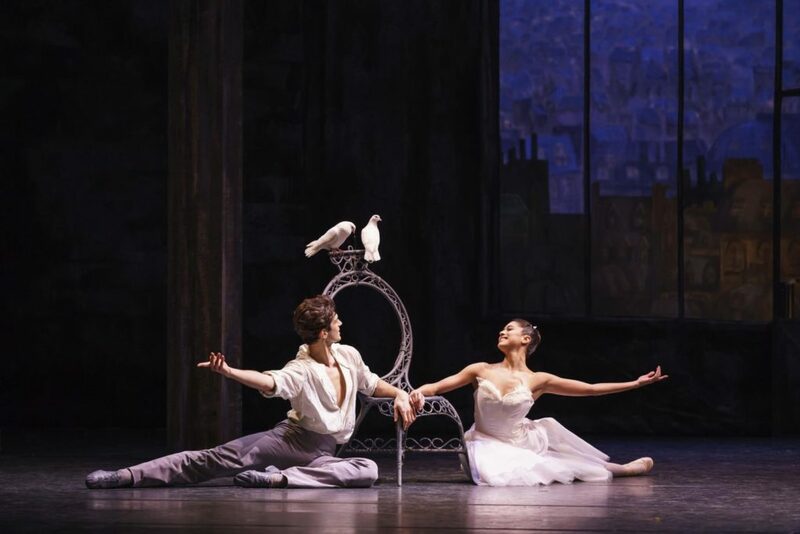 The 1961 choreography of Frederick Ashton’s “The Two Pigeons” had been gathering dust on the back shelf of the Royal Ballet’s repertory until artistic director Kevin O’Hare complied to audience pressure for a revival in 2015. It was led by Christopher Carr, who himself had danced the piece in the sixties and seventies. In a rehearsal video taken for World Ballet Day 2015, Carr explained: “I try to get the very best I can – for the ballet, for the choreography, and also for the dancer.” If Carr says it, you can be dead certain that it’ll be the best for the audience as well. The story of “The Two Pigeons” unfolds in the late 19th century (period décor by Jacques Dupont) and indeed includes a pair of white pigeons onstage. Their courting is mirrored by their wingless counterparts: a human couple – whose romance only blossoms after a slew of trials and tribulations. At the performance I saw, one dove swerved erratically and landed on a music stand in the orchestra pit. Like that dove, the zestful painter (Reece Clarke) strayed, abandoning his model (a young girl of good family danced by Beatriz Stix-Brunell) for a fiery Romani girl (Claire Calvert). After being roasted at the Romani camp, he ruefully returns to the painting studio and to the young girl, who has been waiting and yearning for his arrival. To the audience’s great relief, the pigeon comes to its senses as well, perching faithfully next to its partner. It must have been the female of the pair, because it was immediately courted by the other. bird, indignantly thrusting your head out at your rival, or sitting on the floor in an Odette-like pose and bathing in your own grief? – You are a spoiled little girl. To me, the Romani girl seemed to be the better match for the painter. She was sensual, confident, and outgoing, grabbing at life with both hands. Don’t these women, who don’t need constant approval from others, make love so easy? Here, Ashton got me. After assuring herself of the painter’s affection, the girl’s true nature surfaced. She provokes a trial of strength between the painter and her Romani lover (Lukas Bjørneboe Brændsrød), helps to pinion the painter with a rope, and drags him about. When he is finally thrown out of the camp, she mercilessly gives him the cold shoulder. Now that I think twice about it, the painter wouldn’t have fit into that world anyway. His sensitive artist’s soul dreams the grandest dreams. Like so many artists, he feels misunderstood and insufficiently appreciated. Even if his foray into the Romani world came to a rough end, it was a great chance to gather real-life experience and to let loose from the restrictive mannerisms he’d learned from his middle-class environment. Clarke’s painter happily flings his vest in the wings and, encouraged by the Romani dancers, throws himself into the air, leaping and soaring and totally carefree. My neighbors, who turned out to be Clarke’s parents, told me that it was their son’s debut in the role and that they were quite nervous. There’s no need for that: he did well. The entire cast danced terrifically, bending and twisting and whirling through the Ashtonian flurry of steps with grace. “The Two Pigeons” is set to exuberant pastiche music by André Messager. Barry Wordsworth and the Orchestra of the Royal Opera House played both Messager’s and Poulenc’s scores with aplomb.